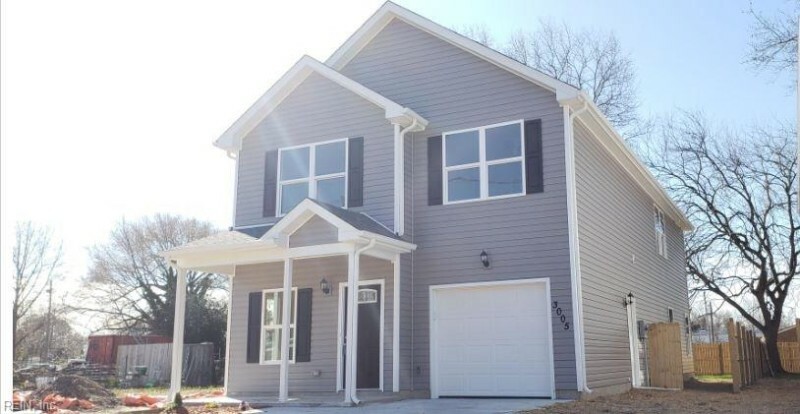 THIS BEAUTIFUL 4 BEDROOM, 2.5 BATHROOM NEW CONSTRUCTION HOME IS MOVE IN READY! THIS HOME FEATURES AN OPEN FLOOR PLAN WITH A SPACIOUS GREAT ROOM AND 9' CEILINGS. GOURMET KITCHEN WITH CUSTOM DESIGNED KITCHEN CABINETRY, SOFT CLOSE CABINETS, GRANITE COUNTER TOPS, STAINLESS STEEL APPLIANCES, AND A BREAKFAST BAR. MASTER BEDROOM WITH VAULTED CEILINGS AND WALK IN CLOSET. ADDITIONAL BEDROOMS ARE SPACIOUS WITH WALK IN CLOSETS. CUSTOM BATHROOMS INCLUDE VANITIES WITH GRANITE, TILE FLOORS AND BATHTUB SURROUND. CRAFTSMAN STYLE INTERIOR DOORS. 30 YEAR ARCHITECTURAL SHINGLES. PRIVACY FENCE SURROUNDING THE BACKYARD. Ready to visit 3005 SMITHFIELD? Request a free property tour! Send me more information about the listing at 3005 SMITHFIELD, Portsmouth, VA 23702, MLS# 10239856. This 4 bedroom, 3 bathroom home located at 3005 SMITHFIELD, Portsmouth, VA 23702 has approximately 2,368 square feet. It is currently listed for $235,000 and has a price per sqft of $9,924. This home is currently Sold under the MLS#: 10239856. This listing is provided by 1st Class Real Estate LLC. 3005 SMITHFIELD Road, Portsmouth was built in 2018. It has Garage Att 1 Car parking.The kitchen includes Dishwasher, Dryer Hookup, Range, Refrigerator, Washer Hookup. 3005 SMITHFIELD is part of the Cradock neighborhood located in 23702.